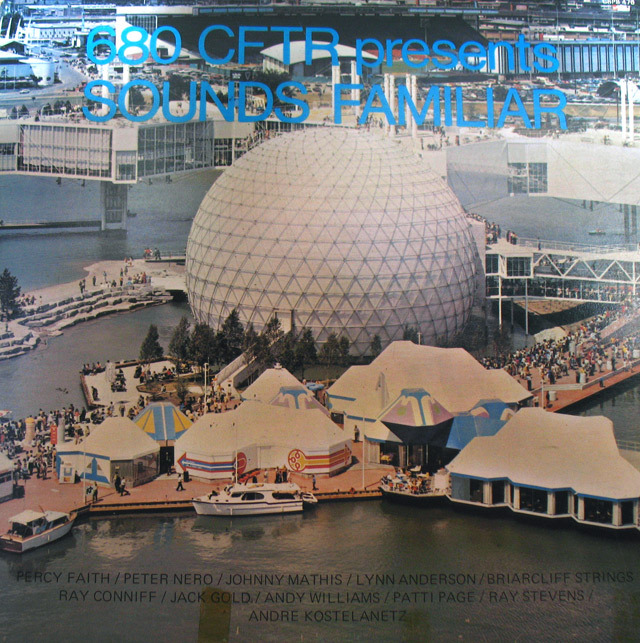 The Cinesphere, as depicted on an album celebrating a change in call letters for 680 AM (from CHFI to CFTR), 1971. 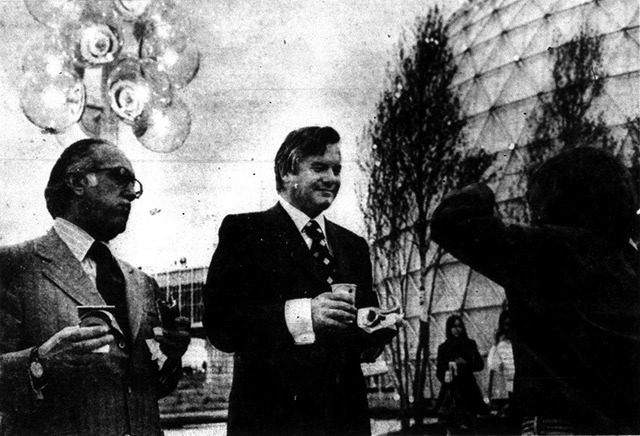 When Ontario Place recently announced intentions to revitalize the forty-year-old facility, one of the most controversial aspects was an indication that the iconic Cinesphere could be among the casualties under the right redevelopment scheme. If wiped off the waterfront, the city would lose the venue that was home to the first permanent IMAX theatre in the world and, judging from audience reaction, was perceived to be the most successful element of the park during opening weekend in 1971, when the other elements attracted lower crowds than anticipated and tepid reviews. Ontario Trade and Development Minister Allan Grossman and Premier William Davis taking in one of the final previews of Ontario Place. Photo by David Davies, the Telegram, May 21, 1971. After the success of the Ontario pavilion and its Oscar-winning split-screen film A Place to Stand at Expo ’67, the provincial government wanted to build a permanent attraction that would capture the spirit of the world’s fair and show off Ontario’s accomplishments and potential. The government already had the Government of Ontario building at Exhibition Place, but it was quickly determined that facility was too much of a landmark to be torn down and unsuited for further expansions to be built upon it. A new venue built at or near the CNE grounds might serve as the revitalization project that many local officials believed the annual fair desperately needed. If placed on the water, the project could also serve as the kick-start to waterfront development (even if it was just another scheme in the long series of dreams to improve Toronto’s shoreline since the days of John Graves Simcoe). A tight construction timeline was set—fill from recent expansions of Commerce Court and the subway began making its way to the waterfront within a week of the announcement to start two years of building that would culminate in a May 1971 opening. There were suspicions that the short time frame was due to the governing Progressive Conservatives wanting to show the project as a major accomplishment by the time the next provincial election rolled around. A dispute with Metropolitan Toronto over title to the lake bottom threatened to delay initial construction, but the regional body and the province came to an agreement when Queen’s Park officials pointed out how bad local politicians would look if they let a turf war scuttle the project. Construction proceeded smoothly, with only minor tweaks to the Cinesphere, whose capacity was reduced to eight hundred seats. In an interview a month before opening day, architect Eberhard Zeidler promised that audiences viewing the six-storey-high screen would feel like they were floating in space (“Isn’t that an idea to play around with?”). The first IMAX film shown at Cinesphere, North of Superior. Directed By Graeme Ferguson, 1971. 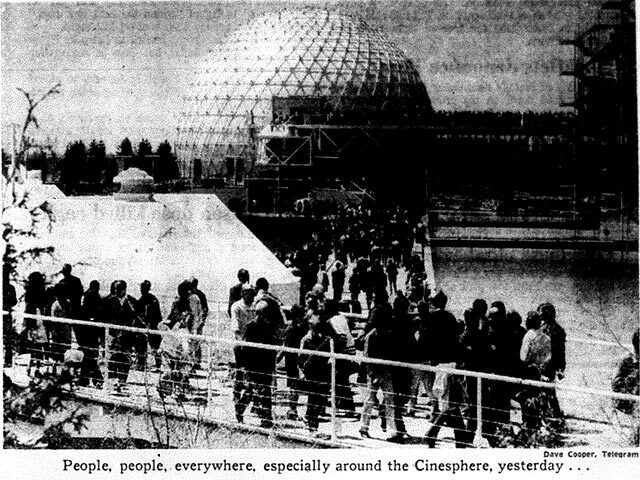 Lineup for Cinesphere during its opening weekend. Photo by Dave Cooper, the Telegram, May 24, 1971. Such innovations are rather like the changes in automobiles which are supposed to make you want to trade in your old car for the latest model…There’s something faintly offensive about all that money and effort being poured into something so stupefying as this weekend supplement vision of the good life; it’s like producing a TV commercial for beer or menthol cigarettes on the scale of Ben-Hur. It seems that those entrusted with the job to do this…didn’t really believe they had anything to talk about. Lovely wilderness, lovely people, amazing machinery: that was all they could see. And, of course, there isn’t anything enormously special about that combination, particularly in comparison to Canada. Excerpt of promotional film showing some of the opening festivities at Ontario Place, 1971. Critical reservations didn’t faze audiences who attended the opening weekend of Ontario Place. Cinesphere was the undisputed success when the park opened to lighter-than-expected crowds on May 22, 1971 (traffic reports from that Victoria Day weekend indicated more Torontonians were content to sit in their cars on the way to Niagara and cottage country than head to the new park, which raised suspicions among park officials that the chaos they projected scared off potential customers). By early afternoon on May 23, guides with megaphones announced that the wait to see North of Superior was an hour and a half. The half-hour screening schedule was abandoned as the film was shown as quickly as audiences could be ushered in and out of the theatre. Viewers applauded the opening assault on their senses as they were enveloped by the majestic scenery and bombarded with Bill Houston singing “Ojibway Country” from as many speakers as Heinz varieties. While customer surveys found fault with the other displays and the poor logistics of moving from one venue to another, nearly all agreed the Cinesphere was more than worth the one dollar admission charge to Ontario Place. Additional material from Ontario Place: The Origins and Planning of an Urban Watefront Park by Arlene Gemmill (Toronto: York University, 1981) and the following newspapers: the March 11, 1969, April 17, 1971, May 21,1971, May 24, 1971, and May 26, 1971 editions of the Globe and Mail; the May 24, 1971 edition of the Telegram; and the March 11, 1969, May 15, 1971, May 18, 1971, May 20, 1971, and May 24, 1971 editions of the Toronto Star.